I participated in an Influencer Activation on behalf of Mom Central for Urbini. 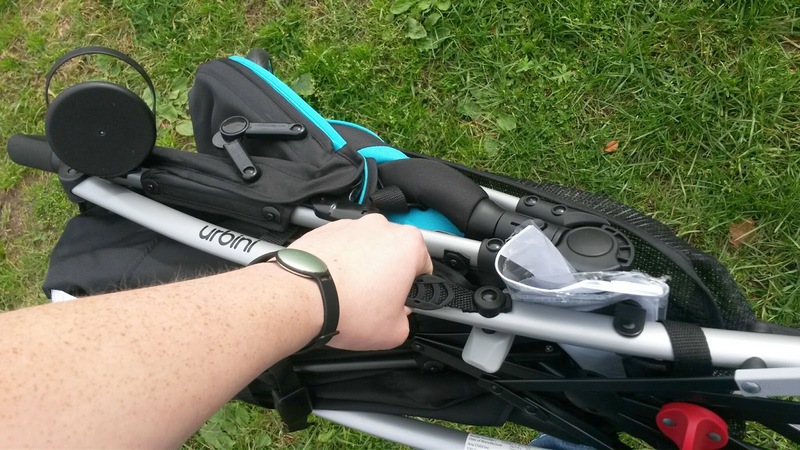 I received an Urbini stroller to both facilitate my review as well as thank me for my participation. Let's face it... babies can be expensive! But, they don't have to be. 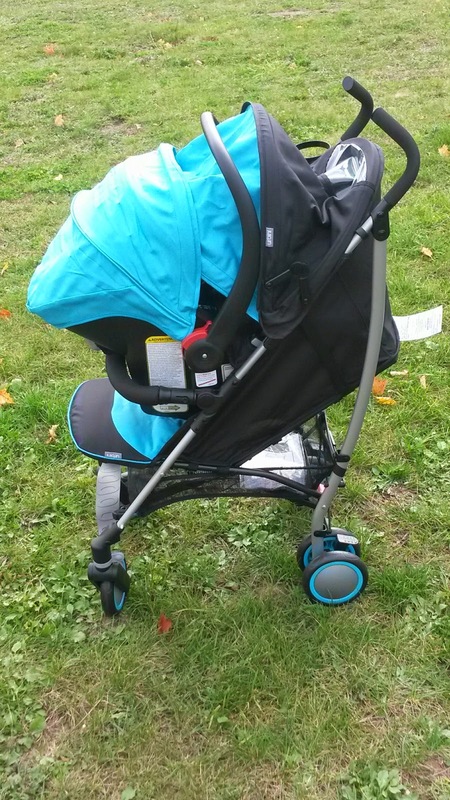 If you are on a limited budget, or if you just want to splurge on something other than a travel system, then you should check out the Urbini Touri. This travel system has a sleek design and is very pleasing on the wallet. At the current pricing of $119-$149 for both the infant seat and the baby stroller, this is definitely a steal! The Touri makes it incredibly easy to bring baby along for the ride. This complete travel system includes the Urbini Petal Infant Car Seat and the fully-featured lightweight Touri stroller that has a reclining seat, removable cup holder, tuck-away sun visor, and a compact fold. It's ready to roll when you are. Light, stylish, complete. The world is waiting! So, we got to test drive this set. For the price, it's pretty amazing. It's like getting the stroller for free, really... and that's the best lightweight stroller you can get! The car seat itself was decent. It is thin, so it is great for the middle bench seat placement. Designed for rear-facing use only, for an infant from 4-35 lbs and up to 35" tall. It only weighs 8lbs, so it's lightweight, too. The one problem I had with this seat is the harness straps. After adjusting them, I just could not get them to sit evenly on Orrin. The one strap just seemed to not tighten up like the other, and even trying to evenly tighten them myself in the back didn't work. I'm not sure what the issue is, and I've read the manual several times to be sure that I have threaded the straps correctly. I think it may be because of how close the straps are to one another, and that Orrin was a bigger baby. If you look at the picture you can see that the harness straps are a little off. Other than this, the car seat looked great and seemed comfortable. The buttons are pretty typical for most car seats, and there is a removable infant and preemie insert for the car seat. There are also harness strap shoulder pads, which I removed to try to see if I could get the straps to be positioned better. 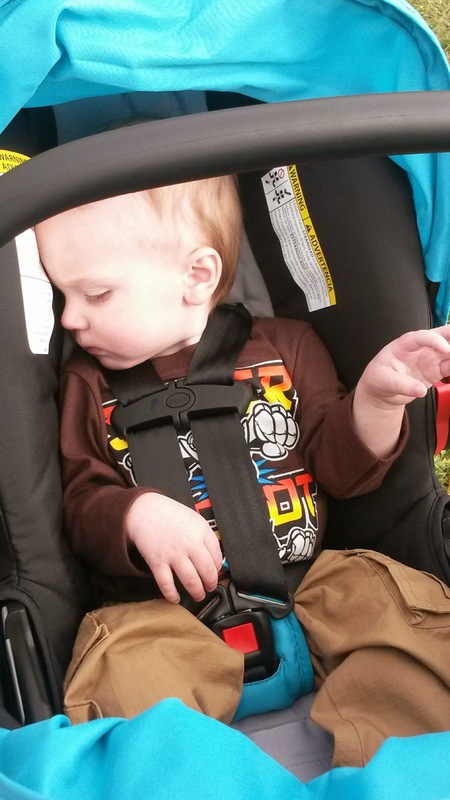 The release latch on this car seat/base is one of my favorites. It is much easier than some other car seats I have used. The stroller is basically a nice umbrella stroller. I found that the basket is very small (not even big enough for a diaper bag), but it does have one, which most umbrella strollers do not. The handles are comfortable, and even my husband enjoys pushing this baby stroller. The stroller seems to roll well, even on rough terrain. We went for a walk on a nature trail and there were no complaints from my husband! My favorite features of the stroller are how it folds and locks. When all together, the Touri stroller is pretty compact, and it has a very convenient carrying handle. If you look above, you can see the red circle in the lower right of the picture. Well, that is what you use to open and lock the stroller in the open position. 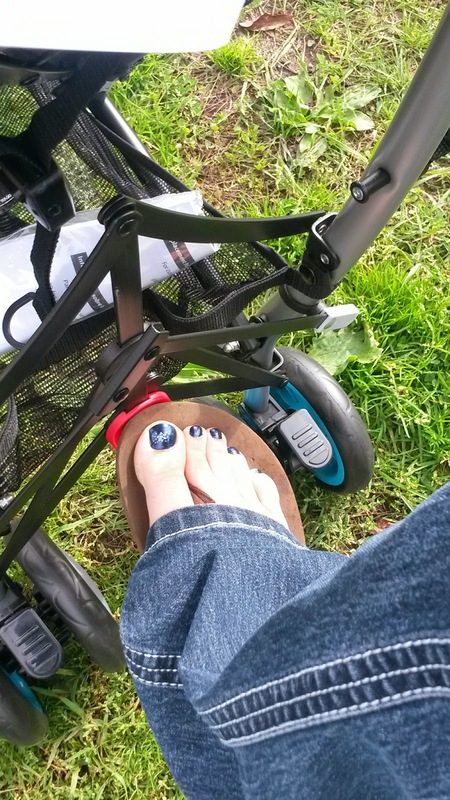 The stroller also has a removable cupholder, which is a lot better than no cupholder (which most umbrella strollers are known for). Another great feature for me was the fact that when used as a travel system, the canopies completely cover the infant seat. (See first picture in post). This is important for us, since we love to let the baby sleep- and bright sunlight doesn't allow that! It also helps to protect the baby from any other elements that may be out there. 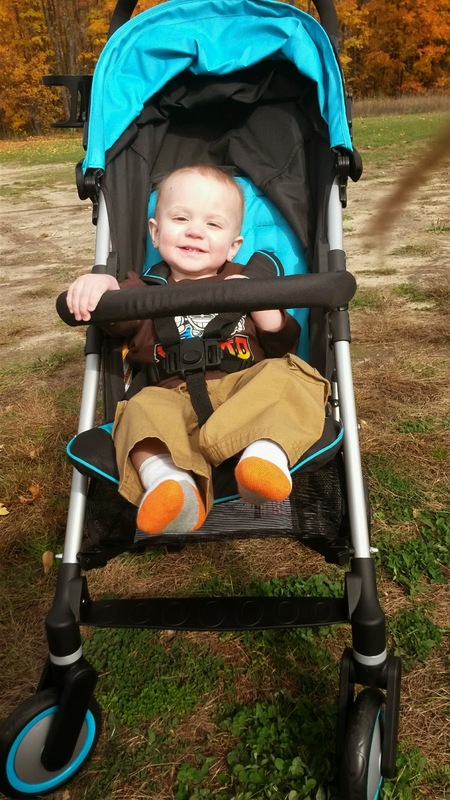 As the stroller alone, this is a very lightweight stroller that also includes an adjustable 5 point harness with shoulder pads and removable arm bar. The footrest can also be adjusted, and there is an adjustable recline as well. The front wheels can be locked in, or allowed to swivel depending on what your need is. Overall, this is a nice budget travel system that looks great and will be a great option for many parents. If you are looking for something with a little more features, you can also check out the still affordable Urbini Omni travel system. Also check out the Urbini Facebook and Twitter pages.